Private Cloud: This feature is disabled by default. See Enabling geo aggregation and geo maps for instruction on enabling it for Private Cloud installations. API growth trends - Use the Traffic metric to see where your traffic is coming from. By using different time periods you can see which countries generate the most traffic at which times. You can also record traffic rates over different time periods to see trends in growth. 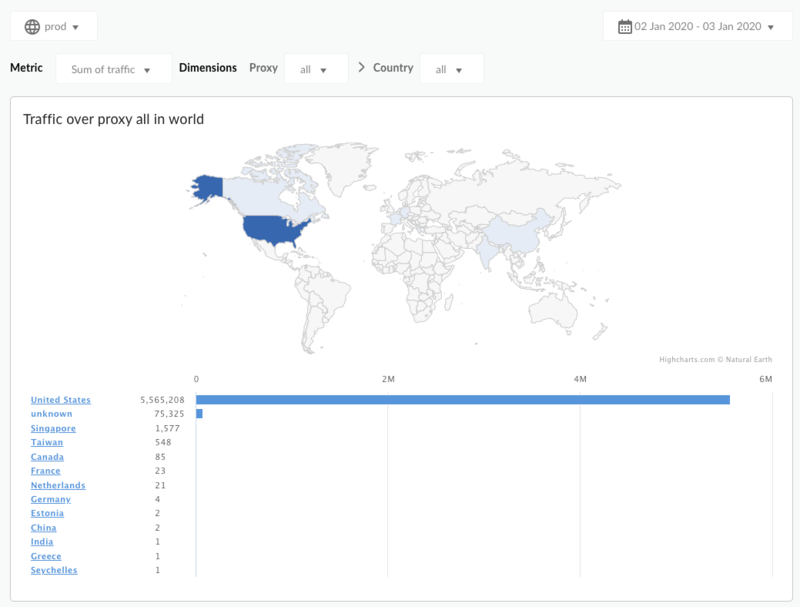 Error trends - Use the Error Count metric to see where where API errors are coming from. By using different time periods you can see which countries generate the most errors at which times. You can also record error rates over different time periods to see trends in growth. Quality of service - Use the Average Response Time and Average Target Response Time metrics to see how your backend services are performing by country. By default, the dashboard displays the Traffic metric. Select the metric to measure from the Metric dropdown menu. Traffic Also known as throughput. The number of API requests and resulting responses seen by the organization. Error Count The total number of all API requests that are unsuccessful, that is, the request does not deliver a response as desired by the end user. Average Response Time The time an API takes to respond to an incoming request. Average Target Response Time The average time it takes the target endpoint to respond to an incoming request for the selected period. By default, the dashboard displays metrics for all API proxies. Alternatively, select an API proxy to measure from the Proxy dropdown menu. 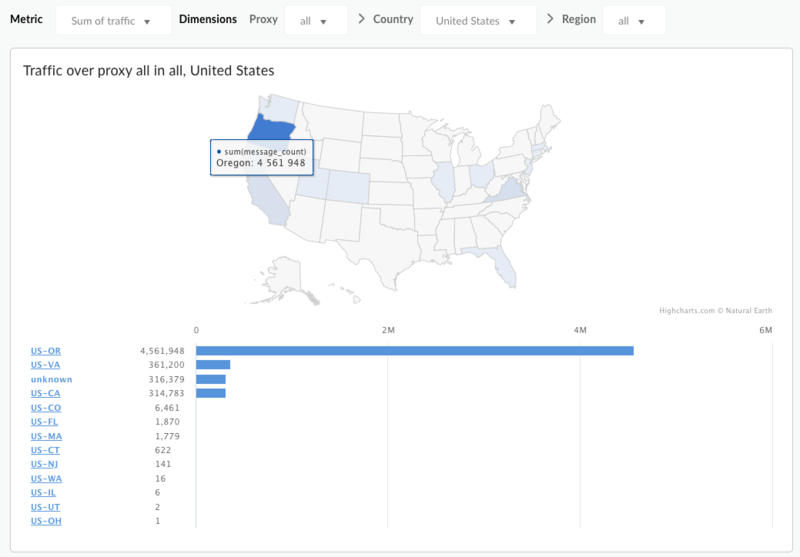 Select an entry under the Traffic By Location list to the right of the chart to drill down on specific countries, states, and cities (depending on the specific geography of the country you are interested in). Any country for which metrics are recorded will appear in this menu. For example, you can look at United States data, then select a state, and then view a list of cities from which traffic is generated. City drilldown is currently available only for the United States and Canada. This dashboard uses standard controls, like the date selector, hovering over maps for more context, exporting data to CSV, and so on. To learn more, see Using the analytics dashboards.